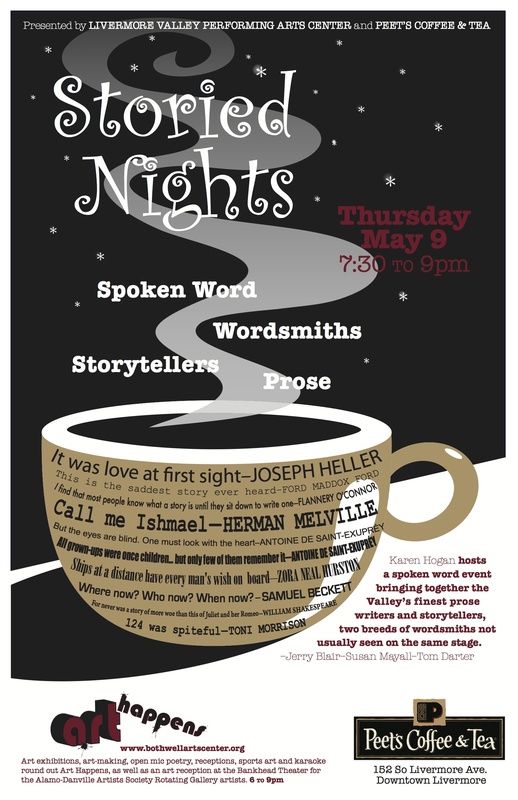 I don’t normally use my blog for this kind of post, but I think it is important that my voice be heard about Storied Nights: an Evening of Spoken Word, a venue in Livermore that brings the art of writing into the cultural event called Art Happens. It started in May 2013 with me as the host. For eight years, I hosted Saturday Salons at Fourth Street Studio, where poetry and prose happily co-existed. I had to close Fourth Street Studio in 2011 because I could no longer afford to keep it open. I called it Livermore’s Literary Arts Center. Once I closed it, I began a quest to find a venue that would elevate the art of story on par with poetry. In addition to the bi-monthly poetry readings, the poet laureate created another venue—one that would be part of the downtown Art Happens (similar to an Art Walk). It was poetry only. It would not accommodate prose. I sought advice from Len Alexander, who was then the Executive Director of Livermore Valley Performing Arts Center (LVPAC). We met for coffee several times to discuss bringing story to Art Happens. It was clear to me that it needed a sponsor, I could not do it as an individual. He said he would see what he could do. Time passed. Tom and I took a walkabout that took us to Sequim, Washington. Economics and time-of-our-life changes intersected and we decided it was time to sell our house in Livermore and head to the great North West. The week we returned, over coffee, Len told me that he had found a venue and LVPAC wanted to sponsor Storied Nights: An Evening of Spoken Words. The first event would be in May. I told him my news that we would be leaving, but that I could definitely organize and host the first event (perhaps the June event as well) and that I would find someone to run with it after I left. And that is how I came to ask the current host if she wanted to take over where I left off. She was not the first person I talked to because earlier in 2013 when I asked if she was interested in working with me to find a venue, she said she didn’t have the time. I was grateful that the timing was right for her to step in and take it over. Much to my dismay, from the beginning, she began to rewrite history, claiming that the Chair of the Commission for the Arts, rather than I, had asked her to host this new series, and implied that she would be launching the series. I do not to this day understand why one would do that, essentially scrubbing me from the picture. I worked hard for ten years to establish a venue for writers in Livermore. Besides hosting the Salons, I published five anthologies, organized release parties for each, and produced several Unusual Evenings of Spoken Words. I had to swim upstream—and I will never understand this either—because there was an unspoken rule that there was not room for both poetry and prose in Livermore. The current host was the right choice to take over Storied Nights. She ran with it, made it her own, and from what I can see on Facebook, it is thriving. She is starting an open mic night in the tradition of Saturday Salons and continuing the quest to open a literary arts center to replace Fourth Street Studio. I don’t know whether she doesn’t understand the value of what was given to her—a series with a venue in place, a pretty robust email list, and a built in community of writers to select from for readings—or if she is choosing to ignore how my efforts led to the series. In our final coffee meeting before I left Livermore Len Alexander gave me a framed copy of the poster for the event that launched the series and told me the series was my legacy. My biggest frustrations during my time in Livermore was a cultural undercurrent that held that there was not enough to go around—not enough talent, not enough skill, not enough enough. More than once, my contributions were implemented but I was denied credit for them, even though there was documentation that backed up my contributions. I am absolutely baffled as to why diminishing another is somehow necessary for one’s success. I am also hurt by this. I have gone back and forth as to whether or not I should write about this—or more accurately whether I should publish what I write. If you are seeing this, I made the decision to publish it—not to settle scores, but because I think it is important that artists get their due, and that they stand up for themselves when it is denied them. This entry was posted in Writing and tagged artists denied credit for work, prose and poetry, Storied Nights: an Evening of Spoken Words, venues forprose. Bookmark the permalink. I also hope by posting this, I can show that the notion that you have to diminish and demean others to elevate yourself is, to quote Marianne Moore, “a wart on so much happiness.” I’m a little confused…Isn’t that what you just did?!? Julie, Actually, I don’t think that’s what I’m doing. I’m not sure why you see it that way, but would be interested in why you say it. I believe I just told my story to clear up misconceptions. Julie, I would also ask you who you thought I diminished or demeaned. Having lived in Livermore for many years, I know what you are talking about. Livermore was/is a town very full of itself, and thus those who are the fullest of themselves are constantly checking their backs. I recall when we started the Auxiliary Players. The “adults” of Cask and Mask were horrified that a bunch of high school and college kids would have the audacity and temerity to demand to use “their” May School Theatre! We did it no damage, had full houses every time, and always got excellent reviews – even when the review dumped on us. We never gave up and we won. Like your friend Len, we found adult support from a few, but very influential people. Interestingly, I don’t recall any of the Cask and Mask originals ever coming to any of our shows. There are many other examples, too. Don’t get me started on who could and who could not display their works in the Public Library! And who got the choice spots and who didn’t. Led to my total abhorrence of “collage” to this day. Steve, I know there were those among the Cask and Mask crowd who supported us. My favorite part about Bob Several is he did give us a bad review — or more to the point, he said he respected us enough to say we didn’t quite get there with the all depressing play evening — said we didn’t have the life experience yet to fully realize the emotions of the play. He was probably right — though we all have life experience in spades now! A big shout out of thanks to those who supported us. Wow, Karen – I’m sorry to learn about all this. In my mind, there’s no diminishing of another in your account. In fact, you’ve paid an individual positive recognition. But, yeah – if there’s a misleading history laid down, i.e., LIE, then it’s important to set records straight. I just checked my trusty Elliott Bay Book Company calendar from 2013. I found a Wed. June 19th entry telling me to email somebody in Livermore. Must have been a reading confirmation ‘cuz on Thursday evening September 12th, by request, I read “Thunderheads,” which you published several years ago in one of your wonderful 4th Street Studio-based anthologies. I was glad the anthology had been remembered and also to share time with Gary Turchin, a former SF Writers Workshop colleague and published author, and I had fun, even though radio-voiced barristas, a truculent espresso machine, and general coffee shop bustle vied for our attention. After the reading, I was told you’d moved to Sequim. “Wow, why Sequim?? ?” prob’ly went on longer than necessary, but since I actually know where the hell Sequim is on an immediate basis, I thought the fan of cartoon question marks over my head were justified and dead serious honest. I also thought, that even though it was none of my business, I would learn “Why Sequim?” And I did. And now that you’re several states away from something you founded, built up, supported, and fed…it’s no surprise to me that that jewel, already mined, cut, and polished would be stolen for another’s aluminum foil crown. Tiny little world, ain’t? Thanks, Ethel. As I replied in an earlier comment, your finding a new creative outlet is no doubt great for you, but boy will the world miss your stories. Hope you can find time in the future for both. I’m sorry I didn’t get a chance to say goodbye in person, but I suspect women as wild as us will cross paths again some day! Let me know. Email me karenwrites@pacbell.net and I’ll send you my phone number.